Suffragette is one of those films that could have fallen flat on every level. With the wrong script, it could have come across as preachy, as if it were trying to force its views on the audience and even lecture viewers on 'the right way to behave'. Thankfully, this isn't the case, as Suffragette is actually a rather good film. It's bound to have its naysayers, and it certainly won't go by without any controversy, but what director Sarah Gavron has put together here is a sharp, focused piece of storytelling that does an admirable job of portraying big events on a smaller scale. Suffragette focuses predominantly on the working class, and how the Women's Rights movement affected the women (and the men) at the bottom of the social scale. Maud Watts (Carey Mulligan) is at first hesitant to get involved with the suffragettes, but once she does the world around her changes entirely. And, for the most part, everything we're shown works on both a dramatic and an emotional level. Mulligan is on top form here, her strong cockney accent becoming just one of many endearing qualities to Maud. Her love for her young son is unarguably at the forefront of her character throughout, even when events escalate and the violence picks up, it's impossible to forget that Maud is a mother. It's testament to both Mulligan's incredible performance and Abi Morgan's smart script that Maud feels so well defined very early on in the film's narrative. Morgan writes her exceptionally well, giving her arc from oblivious laundress to envisioned feminist a real sense of journey while matching the negatives with the positives; it's hardly smooth sailing, of course, but there are moments of progression if not for the overall suffragette movement, but for Maud as a character. Yet none of this would sell itself without Mulligan, who plays Maud delicately at first, but grows in strength as the story progresses. In the early scenes, Mulligan delivers her dialogue softly and gently, but by the end her voice has changed. It's all very clever, very intricate stuff. 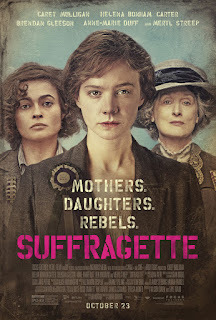 While Suffragette works well in its quieter moments (a brief scene between Maud and her son in the middle act is especially enjoyable, as is one of very few comedic pieces in which Maud and fellow suffragette Violet fall through a broken bed), this film is at its most compelling when it gets dark and violent. This could easily also act as a criticism; after all, should violence be the selling point of a film? When it wants to be, Suffragette is a dark, grizzly affair, but it more than earns its right to be. With poor character work and weak scripting, the violence and the suffering these women go through would feel woefully hammered in and could very easily fall flat. But thanks again to Mulligan (and those around her including Helena Bonham Carter, Anne-Marie Duff, Ben Wishaw and a brief but satisfactory cameo from Meryl Streep), Morgan's script and Gavron's direction, the darker moments rightfully and justifiably stand out as the most memorable. A force-feeding scene with Maud is especially tough to endure, as is the initial violent attack on the women after they rebel following a distressing rejection from the British government. Suffragette is not an easy watch. It's considerably lighter in tone than other recent films that also depict battles for Human Rights, most noticeably 12 Years A Slave, but it doesn't feel as if it's letting down an important part of history, either. Focusing on the working class was a smart move, as it allows the film to really get inside the city and show us how things were back then. It forces the viewer to look up at the uncompromising government rather than down on the pleading individuals, but still finds time to flesh out characters from both sides of the story. It isn't entirely seamless, there's a plot point towards the end of the middle act that would just about be believable if it didn't take place on a specifically involved character's birthday; rather than add drama, it just makes you question the motives of another character a bit more than you really should. Also, this is hardly a criticism of the film itself, but the marketing campaign has played some debatable tricks involving Meryl Streep here. She's plastered all over billboards and posters and trailers, yet appears on screen for no more than two minutes. It doesn't make the film categorically weaker, I just think it could have been useful to the story to see more of her side of it. Nevertheless, Suffragette is still exceptionally well told, and it boasts some of the finest performances you'll see all year. Oscar nomination for Carey Mulligan, please. To Summarise: Smartly using powerful true events to its advantage, Suffragette is a gritty, intricately made historical drama, strengthened by its clever screenplay and an award worthy performance from Carey Mulligan.